One citadel, two commanders (lose all your citadels or commanders, and it’s game over), a handful of guards, and a whole, randomised, unexplored world. Now go out and conquer it! However, the truth is very different. While COE3 wears the trappings of the 4X genre, it boils down three of the genre’s four elements into something that’s not just simpler and faster to play, but also distinct in emphasis and feel. As such, this is to 4X games what 30-second RPG Half-Minute Hero was to Final Fantasy; the parallels are there, but they point in a different direction. To begin with, unlike a 4X game, you won’t even be able to build anything at the start of COE3. Early on, troops are expensive – too expensive to afford with just your starting citadel! So how do you expand your army? 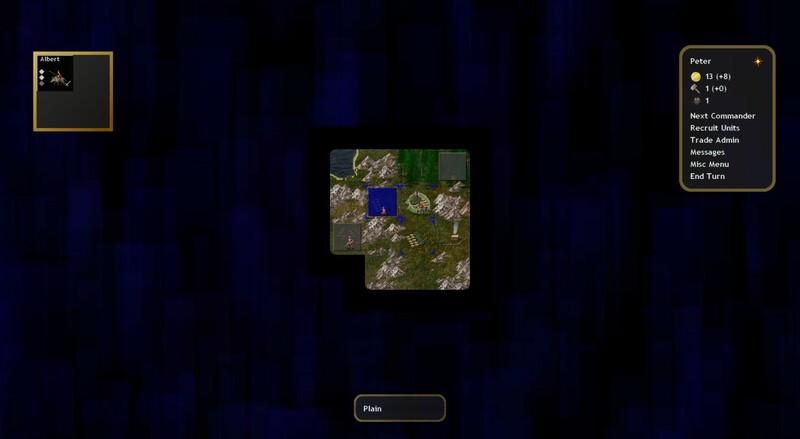 The answer lies with the useful locations that dot Elysium. Some will provide resources to fund the expansion of your army. Some will count as new citadels, allowing you to recruit troops in the field as well as moving all your eggs out of one basket. Some will let you power up your mages, and so on. So the first order of business is to find, and then secure, those locations. Even within a category, not all locations are created equal. For starters, different classes need different resources. Settlements and mines provide gold and iron, which everybody needs. If you’re playing a vanilla human class, the Baron or the Senator, those are all the resources you need: go bury the world in knights and legionaries! However, most classes will need other resources to unlock their special abilities: the Troll King gathers fungus from forests for magic rituals, the Dwarf Queen and the Warlock collect magic gems from mines, and so on. Different classes might also get bonuses/penalties to specific locations: the Senator makes more money from everything, while the Dwarves make more money from mines and less from settlements. On top of that, different locations are also guarded by independent forces of varying strength. Generally, a prize will be commensurate with the difficulty of taking it: you might find one or two spearmen defending a farm that brings in 1 gold per turn, while a city bringing in 5 gold and 2 trade (allowing you to buy/sell other resources) might be held by 20 men with zweihanders and longbows. Still, that’s only a general rule. No two locations of the same type will have exactly the same defenders, so stumbling across a soft, juicy target is a big part of the thrill of exploration. Once you’ve taken a location, you’ll then need to hold it. Even leaving aside other players, Elysium is packed with wandering independent monsters (deer, bandits, snakes, undead…), and more will spawn from their lairs. These will constantly raid your possessions, and movement in the game is slow enough that you likely won’t want to circle your main force back to recapture lost ground. But detach too many men for garrison duty, and you could slow your expansion. Early expansion, then, is a constant, delicious trade-off between risk and reward (do I have enough troops to take that mine? ), followed by a juggling act between offence and defence (how many troops can I safely leave behind to garrison it)? For me, the game is strongest in this phase, when every turn is filled with curiosity about what may lie over the next hill; excitement when I discover my El Dorado; and a stream of interesting decisions. The above screenshot illustrates this aspect of COE3. In this game, I hit the jackpot: two cities nearby, one of which was held by a mere eight men! Unfortunately, I promptly squandered it: when I rushed in to attack, those eight men were plenty to wipe out my attacking force, including my only two commanders. Game over. Hey, what happened to “Exploit”? Why were those cities such a big deal? Could I have established my own? Well, no. Importantly, there is precious little economic or empire management in COE3. For example, research is important in Civilization or Dominions, but in COE3 there is no research and no tech tree. If you want a magician to learn a new spell, you conquer a library, sequester him/her for several turns, and watch as he/she emerges with a new entry in the spellbook. Similarly, there is virtually no “guns or butter”, virtually no way to invest in one’s economy now for a future payoff, and little terrain improvement. There are exceptions. The Burgmeister, who presides over a nation of diminutive, weed-growing humanoids, can spend money to “colonise” farms and transform them into more productive hoburg villages. A couple of the other classes can transform the map to increase their unit production: the Troll King’s allies can spend resources to haunt forests, which makes them spawn friendly wandering monsters, while the Dwarf Queen has to invest gems and gold to set up new daughter colonies. Still, this game’s emphasis is firmly on fighting wars, not winning the peace. Note that each army is lined up in rows. 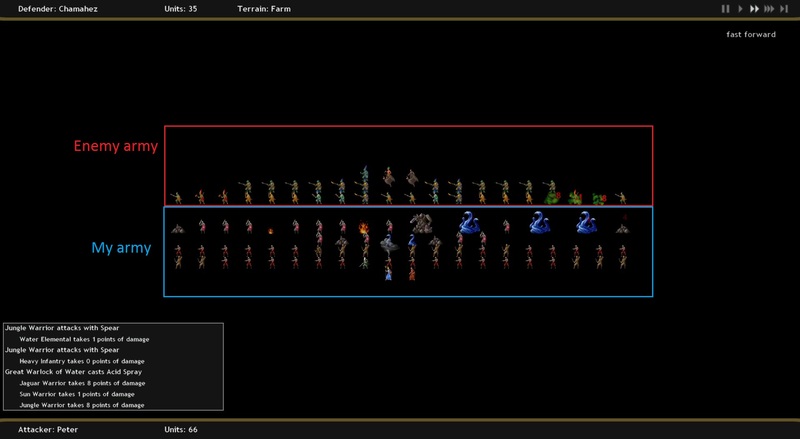 The concept is a little like Ogre Battle or Disciples: a unit’s abilities depend on which row it’s in. Melee units in the back rows will be unable to attack, archers in the front row will attack with daggers instead of their primary weapons, and so on. Here, though, you don’t choose who goes into which row – archers and crossbowmen are always in the middle, swordsmen always towards the front, and so on. On its turn, each unit then picks a random target, usually limited to the enemy’s front row (certain attacks are an exception). As a result, army composition is where much of the game’s strategy lies. 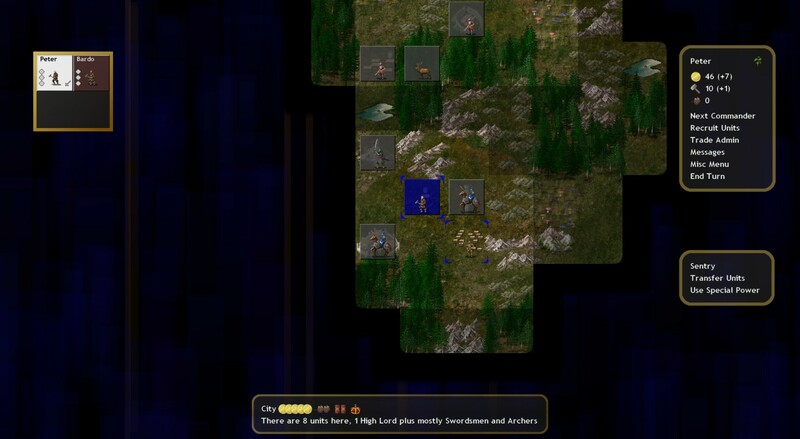 For example, multiple rows of ranged units can all shoot while only the front row of melee units can attack. But those melee units at the front must survive to shield the archers. So how might I best divide my army between the two? Returning to the above screenshot, my front rows comprise the most heavily armoured infantrymen I can recruit, plus hulking fire, earth and water elementals – ordinary grunts have the life expectancy of mayflies. Behind them I have two rows of archers and crossbowmen (the soldiers in the red trousers), plus a lightning-throwing air elemental (the cloud/tornado in the middle). At the very back are my leaders: the Great Warlock of Water (in blue) and his apprentice (in saffron). This combination worked like a dream: the infantrymen and elementals held fast, the crossbowmen compounded my firepower, and the Great Warlock laid waste to whole rows of the enemy army with his high-level magic. My army would probably have looked quite different had I been playing another class. My Warlock started with a roster of generic human soldiers (paid for with gold and iron), supplemented these with elementals (paid for with gems), and boosted his own magic (gems again). By contrast, the Troll King fields a handful of powerful, expensive behemoths (himself foremost among them! ), accompanying mages who can scry out their next target, and goblin cannon-fodder. Playing the Warlock feels like leading an army; playing the Troll King feels like leading a small but elite raiding party, marching to a soothsayer’s tune. Not every army is as distinct as the Troll King’s, but that still leaves variety: for instance, the Senator relies on row after row of legionaries, armed with javelins for ranged combat and gladii for melee. No need to worry about separate spear- and crossbowmen for him! Eventually, it’s time to take the war to the other players (if they haven’t been destroyed by other AIs or the independent monsters). Unfortunately, for me this is the least satisfying part of the game. True, it’s fun to finally unleash late-game units and magic, and there are still some interesting decisions to be made. Do I go for an early attack or a late one? (For example, from what I’ve seen the Troll King is much better suited to rushing; early on he can clean out entire villages by himself, but he can’t solo even a mid-sized army.) Do I split my forces to raid the enemy’s settlements? Can I beat that army or do I fall back on my citadel and wait for reinforcements? But in my experience, this all boils down to who has the nastier stack of doom. Either I show up with a bigger army and steamroll the other player, or the other player shows up with a bigger army and steamrolls me. No control over battles means no scope for superior tactics, and no economic management means precious few levers to pull to ensure I have a bigger army in the first place. This is fine when I’m playing explorer and stomping independents; less fine when the other players can try to stomp me back. Presumably the player with the better army did a better job of exploring and securing the map earlier on, had a better grasp of army composition, had a luckier starting position, or all of the above. But for whatever reason, victory or defeat too often feels like a black box to me. After winning or losing, it’s time to start another game. This is feasible in a way it wouldn’t be in the typical 4X game: you can finish a COE3 “large” map in maybe an hour or two, and smaller maps in significantly less. The best analogy is skirmish mode in an RTS – something you can keep replaying in bite-sized sessions – but with random maps. Ultimately, a food metaphor might be the best way to sum up Conquest of Elysium 3. Its big brother, Dominions 3, is like learning how to cook: difficult and time-consuming, but blissfully rewarding in the end. The typical 4X game, say Civilization or Master of Magic/Orion, resembles a meal at a buffet restaurant: enjoyable, filling, and replete with choice, but not something you can quickly consume. COE3, with apologies to Forrest Gump, is more like a box of chocolates. Like a box of chocolates, it’s filled with variety, courtesy of its 18 factions, six eras, and imaginative developers. Like a box of chocolates, it’s better at the start (this is a good game about exploration) than at the end (when I have to fight other players with a toolkit better suited to the player-vs-environment gameplay of the opening phases). And, just like a box of chocolates, COE3 is better suited for snacking than for full meals. If you’re after a light, quick-playing game, one that encourages you to reach in, take a bite, and come back later to sample different flavours, COE3 is worth a look. Hopefully Illwinter will release a demo soon, but for now, you can download its predecessor (Conquest of Elysium 2, 1997) as freeware here; or buy the full game from Desura. Update: there is now a demo available. Time spent with the game: I estimate at least 10-15 hours. What I have played: The Warlock, Senator, Baron, Troll King, Dwarf Queen, Enchanter, Burgmeister, and Barbarian characters. What I haven’t played: Multiplayer; the remaining characters; any difficulty level that gives the computer a bonus. Note: the above comments are based on a review copy supplied by the game’s developer, Illwinter Game Design. Next Next post: Crusader Kings II: Feudalism: domain thing?